DiaTem Engineering enables test engineers and designers to test and debug their electronic boards. This JTAG test station is very powerful for prototype bring-up and the test of small production series. DiaTem Engineering Station is the first efficient JTAG Tool dedicated to board designers and test engineers. Fully integrated in one framework, you can easily debug your electronic board, using the potential benefits brought by IEEE 1149.1 JTAG boundary scan standards. Test coverage has been increased with the clustering process of non-boundary scan components and the test of board edge connectors. Designed by test engineers, DiaTem makes test and diagnostic of faults extremely efficient. Easy to set-up, in few hours, you will get a first result of the structural and functional behaviour of your board. You can fill out the form (mettre le lien) with a description of your needs or you can send an email to sales@temento.com. A reply will be sent within 24 hours. Test and debugging of electronic boards in an industrial context. Tests program developments, debugging, programming, structural tests, functional tests. Development of test programs in an industrialization and a production environment. Industrialization Station allows manufacturing engineers to define test sequences to be applied in a production mode. This station enables the production and preparation of the test and programming operations to be performed on the board. Compatible with most common CAD formats to import test data, it is flexible enough to ensure compatibility with engineering teams tools and Production Stations. A Test Plan Manager authorizes to define sequences and their properties with a graph representation. The Test Plan Manager supports enhanced process controls like messages, labels or conditional branching that extent your test definition possibilities. Test Plans can then be easily and quickly exported to another Production Station as a single directory. Test of electronic boards in a production environment. 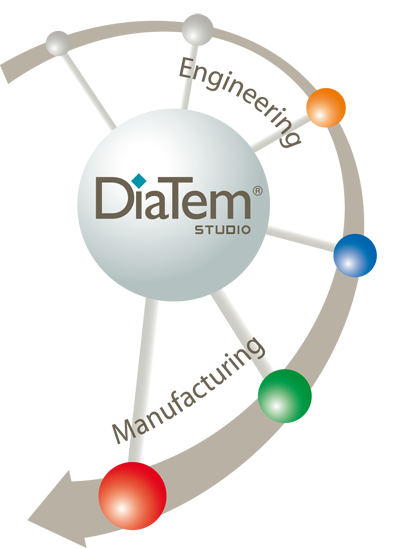 DiaTem Production is a JTAG test station designed for test operators who need to automatically execute test plans and test sequences on a production line. It allows selecting and running a test plan previously created on an Industrialization Station. The settings of a test sequence and the selection of a test plan are performed with the Supervisor level module in order to set up the best test strategy. The Operator level module allows working in a standardized environment, running the selected test plans and to automate your production in a Go/No Go mode. The Production Station is benefiting of definition enhancements that help archiving and tracking fabrication orders. Includes all necessary features to enable a Test Plan execution provided by any Industrialization Station. Either to debug your first electronic prototype or to run production tests on several thousand of boards, Diatem Studio offers a wide range of configurations adapted to your need. Ability to move from one configuration to another and to add key features. Driving embedded instrumentation DiaTem supports ARM, Freescale, TI and others CPUs, Altera and Xilinx FPGAs.